Can You Reheat Rotisserie? | Can You Reheat? 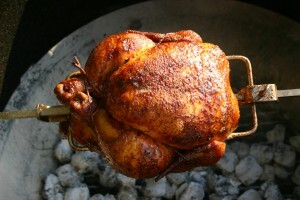 Q: When I pick up a rotisserie chicken from the market, I always think that I am getting a great deal. When they have sales, I always want to pick up more, but I do not know how they would taste after cooling. What is the best way to reheat these chickens? A: Rotisserie chicken is great for meals any time of day and is versatile enough to be made into various other meals for little to no extra work. You can use the oven or microwave for simple, clean reheating. For both of these methods, we are assuming the chicken has been broken down and is not in its whole form. To microwave chicken, most people are afraid of it becoming rubbery, and that is a very real possibility. However, to prevent your chicken from becoming rubbery, you need to microwave in short sessions instead of all at once. For rotisserie chicken, depending on the piece, place on a microwave safe plate and microwave on half power for a minute and a half. Flip the piece over, and microwave on half power for another two minutes. Be sure to test for the desired temperature before heating more. When you want a good old standby for reheating chicken, the oven is the most reliable. Simply wrap the chicken pieces in foil and heat in a 350 degree oven for 15 minutes. Depending on your preference, you can place the chicken on the racks, or a baking sheet for convenience of removal. Always check that the meat is steaming all the way through even after cooking. Because the chicken has already been cooked at the store, cooled when you got home, then reheated, you cannot keep the leftovers as it will have been heated to many times. Not only is it destroying much of the flavor, you could possibly be increasing your risk of getting sick! Never reheat food more than once and ensure that is it heated all the way through.